The program is a collaboration between Massachusetts Institute of Technology (MIT) and Amsterdam Institute for Advanced Metropolitan Solutions (AMS Institute). During the second year of research, important results were achieved, including autonomy of the vessels and a latching system to link and dock individual vessels. In addition, the feasibility of various use cases in the field of waste logistics and food distribution were explored. Depending on the assignment Roboat is given, the boat is able to determine the optimal route from A to B in the Amsterdam canals. Roboat does not only consider how busy it is on the water, and incorporates the characteristics of the canals and bridges such as width and height, it also takes into account possible obstacles that it might encounter on the canals. In order to accelerate the tests and development of the technology behind the autonomous navigation, current prototypes are developed on a 1:4 scale model. The position of the vessel is determined with the help of LIDAR (Laser Image Detection and Ranging), supplemented with camera imaging and GPS sensors. 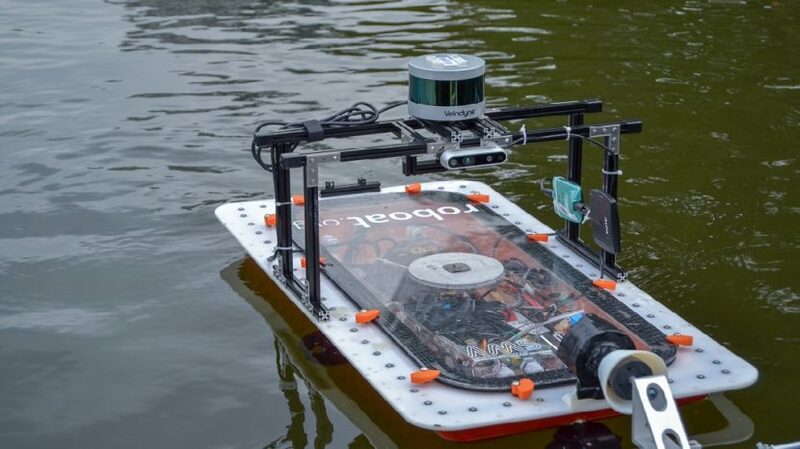 When the vessel encounters an object in the water, Roboat can determine whether it is a stationary or moving object and how far the object is. The vessel then determines the best manoeuvre to avoid the obstacle. After passing the obstacle it continues its optimal route. This so-called motion planner is self-learning and adapts its abilities based on the experience of how the manoeuvres are executed, to keep improving future execution. Next to this, algorithms learn to recognize the behavior of different types of objects and other boats on the water. The more hours the vessel navigates the canals, the better the estimates become. “What is unique about the autonomous techniques we apply in Roboat is that the control system is challenged by Amsterdam’s dynamic urban environment. By applying Roboat in a city like Amsterdam with busy canals we have a great opportunity to improve the control system for autonomous navigation in urban environments. This is something that has not been shown before in other projects for autonomous vessels”, says Carlo Ratti, director of the MIT Senseable City Lab and Principal Investigator at AMS Institute. As the vessels can be latched to each other, temporary infrastructures can be set up to create bridges or platforms, or for example, Roboat units can function as push and tug boats. In the second year of research, the mechanism for latching or docking vessels to the quay was further developed. The vessels can determine each other’s position on the water by using GPS. When the vessels have approached sufficiently to come into sight, LIDAR takes over local positioning. When even closer, the camera is used, which recognizes the visual indicators of the latching mechanism. This is the last step before the mechanism is activated, that links the vessels to each other or docks them to the quay. Roboat’s autonomy and control system is designed in such a way that the system can also control several vessels connected to each other. The algorithms for this purpose were developed in the second research year. By means of these algorithms, the vessels intelligently coordinate interaction and collaboration. The Roboat units that are linked together form a single organism that can navigate and move in a coordinated way. As part of the Roboat project a new type of sensors is being developed and tested. These sensors continuously measure the water quality while the autonomous vessels move throughout the city. Based on the data they gather, a better insight is gained into the quality of surface water and water flows, which contributes to urban water management. In a city where a quarter of the surface area consists of water this is of vital importance for, among others, the health of its inhabitants. In collaboration with Waternet, the research is looking into how the new type of sensors can complement current water quality measurements at fixed locations and basic sensors installed on a manned boat of Waternet. As 25% of the city of Amsterdam consists of water surface, Amsterdam offers the ideal environment to expand its current infrastructure with the deployment of autonomous vessels, alleviating pressure from the relatively small but busy city center. For example, by using Roboat to collect waste from Amsterdam’s city center, the number of traffic movements within the city center can be reduced. For the scenic views on the Amsterdam canals Roboat offers a more attractive way of collecting household waste, which is currently still being placed at the curbs of the canals, distorting the view on the canals, taking up a lot of space and attracting rodents. Upscaling navigation and autonomy to a 1:2 scale Roboat. Due to their size, these vessels have differentdynamics and navigation behavior. Testing prototypes for the collection of household waste in the Amsterdam city center, as well asdeveloping a use case for the urban transport of people and tourists to museums and other points ofinterest in the city. Further developing the latching mechanism for 1:2 scale prototypes to latch individual vessels or dock them to the quays. Designing and refining the propulsion technology, the energy system and the electric charging technology for 1:2 scale prototypes. Further developing the water sensor technology in collaboration with Waternet. Exploring the use of LIDAR and camera sensors for the inspection of quays and bridges (to map possibles subsidence and necessary maintenance).